This past few weeks I have been in many classrooms that are piloting the SMARTER Balanced Assessment. While I am not a fan of practicing for a test, I do not have any problem with using quality techniques to teach that will help our students to practice a processes. Especially if that process includes a solid use of technology integration that will be used in their future as a learner. As I watched students taking the SMARTER Balanced Assessment pilots, I found that I frequently thought to myself, "Wow, I don't think our kids learn in regular classroom processes in that way" or " I bet our students would do better at this is they had some experience taking in information in this way." Then I got to thinking about how I could provide resources, lessons and or opportunities for teachers to give our students practice in instructional strategies. This is the first of a series of blog posts to share ideas of how teachers might practice the process that students will encounter in the SMARTER Balanced Assessment. They are intended to be used with regular curricular activities so that when students encounter them in a testing situation, they don't seem foreign and unusual. 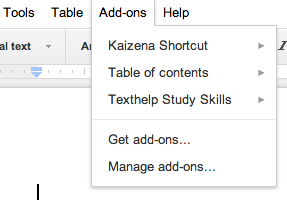 Google recently added Add-ons to Dos and Sheets. They are simple tools that open up a side-bar of tools not otherwise as accessible or even available in some cases. To find Add-ons, look in the top menu, click Add-ons, and Get Add-ons. Much like you add an App or Extension, you can add TextHelp. TextHelp Add-on will require you to give permission to access the account, etc. Once loaded, it will add the tools as shown to the right to your document. Knowing what to highlight when you read, how to use different colors to organize thinking when highlighting, or even how to learn from the highlighting after you have highlighted is a tough skill that students need to learn and will not be an isolated test-taking skill. I prepared a document ahead of time by dropping text I found in a reading passage from Discovery Education into a Google Document. Teachers could use text from curricular resources, online content or even a resource like Newsela as I've blogged about here. While practicing for testing is great, practicing the skill of highlighting using relevant classroom content is even better. Once the document is prepared it can be shared with students easily using the Doctopus script (also available now as an Add-on). This fantastic script will even allow you to share different documents prepared with varied text levels with different groups of students. It just gets better and better! 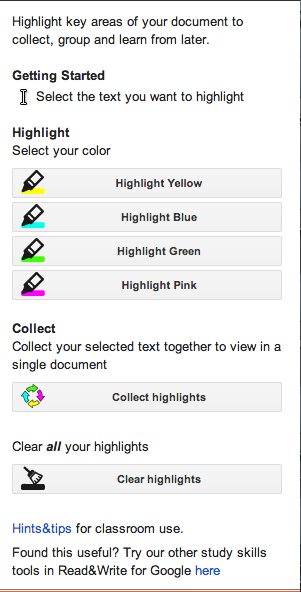 Students open the shared document, enable the TextHelp Highlighting Tools and learn to read and highlight. Not only are they practicing literacy and digital literacy, but preparing for the process used in the SMARTER Balanced Assessment testing process. What I love about this process, is that after kids have done their own work and highlighted a document, they can share easily with a peer, teacher or other adult to discuss their rationale for highlighting. Teachers could even do some highlighting activities in which 3-4 students are assigned to look for certain thinks in text and given an assigned color to use. What other ideas can you think of to make use of this tool in your curriculum?